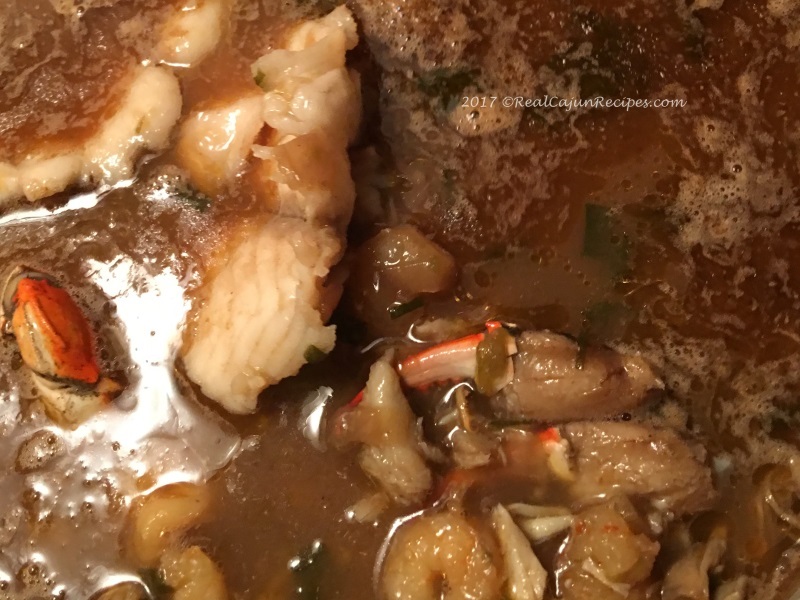 This is a great gumbo recipe from the Houma, Louisiana area. Great anytime but perfect during Lenten season. Chop and reserve greens and vegetables. In separate pot with water, simmer three (7oz.) lightly salted catfish fillets for 15 minutes. Strain through cheese cloth and reserve liquid. Chop the catfish and reserve meat. In heavy bottom gumbo pot, add oil and flour to make a roux. Cook over medium high heat stirring constantly until golden brown. Caution, do not scorch! Add all seasonings except the scallion green onions tops. Sauté for 5 minutes. Add the reserved fish stock and chopped catfish. Add hot water, one ladle at a time, until the consistency of thick soup is achieved. Add the claw crab meat, and half of shrimp. Reduce heat to a simmer. Cook approximately 45 minutes, stirring occasionally. Add catfish, remaining shrimp and green onions tops. Cook 10-15 minutes longer. Season to taste using salt and cayenne pepper. Add more water if necessary to retain volume. Serve with white rice.